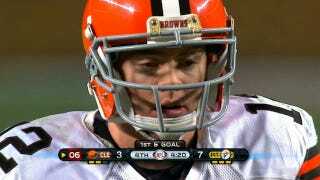 This is what Colt McCoy looked like after James Harrison launched himself into McCoy's face with the crown of his helmet last night. It obviously wasn't a good idea for the Browns to put McCoy back into the game. But after only one play, they did just that. And five plays after Harrison's hit, McCoy threw an interception that ended Cleveland's chances to win. Brad McCoy went on to question Browns coach Pat Shurmur for saying after the game that Colt was fine. He mentioned that the team's PR staff made certain Colt spoke only briefly with the media because the press conference lights were "killing him." He wondered why Josh Cribbs left the game with a groin injury and never returned, when his woozy son was thrown right back out there with a rattled brain. According to Florio, Shurmur said today that McCoy's symptoms only became noticeable after the game. Had he known otherwise, Shurmur said, McCoy wouldn't have gone back in. Kyle Turley: "Suicidal And Homicidal Tendencies Became A Part Of My Daily Living"